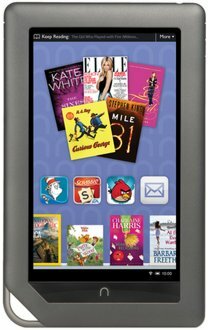 WebProNews is reporting today that Barnes and Noble is working on a new version of the Nook. The device is rumored to be available in the spring. Ebooks are too real books! It is always great to hear someone else say exactly what you thought about a subject. What the heck? Since when are ebooks not “real” books? Isn’t it what’s in them that counts, at least with most books? Needless to say, this article from Urban Times called “In Defense of the eBook” made my day. Check it out and let me know what you think. Do you get upset when people say ebooks aren’t real? I’ll be back on the 19th. If SOPA passes… maybe not. Stop SOPA and PIPA! Two interesting Barnes and Noble press releases hit my inbox this morning. In the first, Barnes and Noble is offering a free NOOK Simple Touch or a NOOK Color for only $99 if you purchase a one-year NOOK subscription of the New York Times. The cost of the subscription is $19.99 and includes full digital access for both the NOOK and the New York Times website. You can access the bundle directly and see the full terms and conditions at www.nook.com/nyt. In the second release, Barnes and Noble is offering the NOOK Tablet for $199 with a one-year NOOK subscription to People. The cost of the digital subscription is $9.99 per month. You can check the details and purchase at www.nook.com/people. These special bundles are available at Barnes and Nobles stores and at nook.com until March 9, 2012. Rumor Mill: Is Barnes and Noble selling off the NOOK? Yesterday, Barnes & Noble announced that they were exploring the idea of selling off the NOOK side of their business. Today, B & N CEO William Lynch talks about that possibility. There’s more at PaidContent, including video of Lynch on CNBC. Note the use of the words possibility, considering and may in these articles….